BELLEVILLE – Cramahe Township’s mayor is concerned that residents keep bypassing safety barriers on Trenear Road following a major sinkhole occurred over the weekend. Trenear Road is located east of Colborne in Cramahe Township. 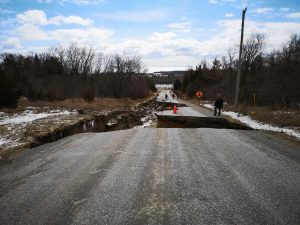 The southernmost section between Old Highway 2 and Trent Valley Road has been closed since Friday after heavy rain and melting snow caused a sinkhole to form and wash out the road. Since then local residents have turned up in droves to see the damage for themselves, Mayor Mandy Martin said Monday. “They’re having an issue with people going beyond the barriers and treating it like the Grand Canyon,” says Martin. At some points, the sinkholes can reach 20-feet deep. According to Martin, the ground around the damaged section is still unstable and new sinkholes could open or the existing one could widen, potentially injuring the observers. Cramahe Township staff is still assessing the damage. Martin said while the damage could be fixed rather quickly, the township wants to make sure the job is done properly and that the road doesn’t simply collapse again next year. There are no estimates to when the road could re-open at this time or the cost involved in repairs. Vehicles were using the road right up until it collapsed on Friday night, she said. Nobody was injured in the incident, she added. 91X FM Newscast – Wednesday, Oct. 19, 3 p.m.
91X FM Newscast – Wednesday, Nov. 9, 2016, 1 p.m.